We’d love your help. Let us know what’s wrong with this preview of Area 50 Juan by Karen Jones. Juan’s goal to save the aliens on Jade Island is threatened by a military search for the downed craft. Juan and his friends; Andy, Davie, and Earl, befriend a young airman named Ziggy who wants to help. With Ziggy on their side, they rush to help the visitors return to their world before the military arrives to search Area 50. Area 50 Juan is a science fiction adventure for Juan’s goal to save the aliens on Jade Island is threatened by a military search for the downed craft. Juan and his friends; Andy, Davie, and Earl, befriend a young airman named Ziggy who wants to help. With Ziggy on their side, they rush to help the visitors return to their world before the military arrives to search Area 50. To ask other readers questions about Area 50 Juan, please sign up. Area 50 Juan is the story of four young boys who discover what appears to be an alien spacecraft. Determined to protect the ship's crew from scientific experimentation, the boys do their best to keep the authorities from getting their hands on the spaceship. If you like the Marvin Redpost series by Louis Sacher, you'll love Area 50 Juan by Karen Jones. This easy-reader is divided into short, manageable chapters suitable for young readers aged six through ten. 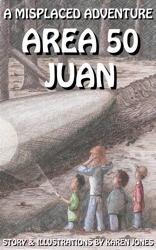 The author's illustrations are lively Area 50 Juan is the story of four young boys who discover what appears to be an alien spacecraft. Determined to protect the ship's crew from scientific experimentation, the boys do their best to keep the authorities from getting their hands on the spaceship. If you like the Marvin Redpost series by Louis Sacher, you'll love Area 50 Juan by Karen Jones. This easy-reader is divided into short, manageable chapters suitable for young readers aged six through ten. The author's illustrations are lively and fun and help to keep the pages turning quickly. As Karen Jones continues her Misplaced Adventure Series, she just keeps getting better and better!